The word sour and fish doesn't sound too appetizing together does it? But don't let that hinder you from trying out this delicious soup. Canh chua is a sour soup produce by fresh vegetables and one key ingredient tamarind. Whole tamarind pulp, pineapple, and tomatoes is used to produce sourness to the soup. Okra, bean sprouts, and a strange stalk called elephant ear (bac ha) is also unique to this recipe. The spongy like elephant ear and slimy okra soaks up the broth and every time you take a bite your mouth is gushing with sweet tangy flavor. Canh chua is usually made with fish therefore it is commonly accompanied by ca kho, Vietnamese braised fish. This recipe also works well with shrimp and again you can use extra shrimp to make tom kho (Vietnamese braised shrimp). 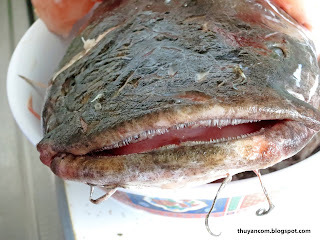 I prefer to make this soup with fish especially whole cat fish. While visiting home this weekend, my uncle brought over some freshly caught striped bass and catfish, they were 5 - 8 lbs a piece. 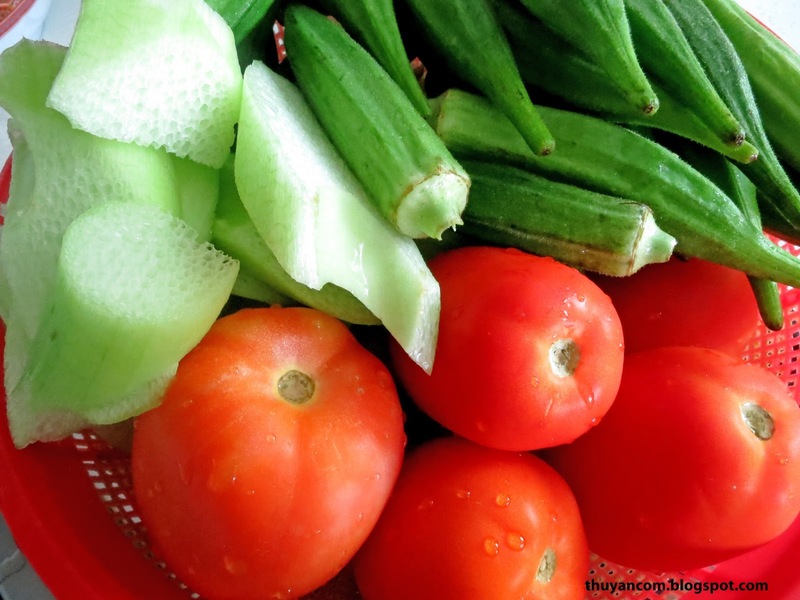 Nothing beats fresh ingredients when it comes to Vietnamese cooking! Without even thinking, my mom and I already know what's in store for dinner. I don't order this dish when i'm eating out very often because everybody like it a different way. 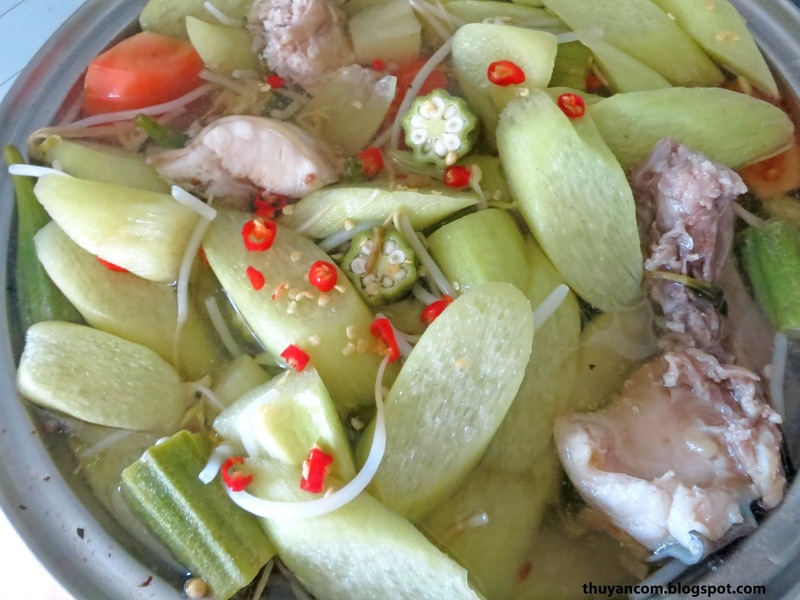 We all have our own interpretation of the perfect canh chua and that is best achieved at home in our own kitchen. Even though it is called sour soup, I like to make mine sweet as well and let's not forget I like everything spicy. When I taste this soup I want to get a punch of sourness, a flicker of sweetness, and kick of spiciness. It's like a party in your mouth, flavors fighting to get your attention. While this soup is usually eaten with rice you can also eat it as a noodle soup with vermicelli noodles. Enjoy! 1. Marinade the fish by sprinkling it evenly with salt and dash of fish sauce and some green onions. My mom likes to pan sear her fish ahead of time so it won't break a part when you put it in the pot. 2. Fill a 8 qt. pot 3/4 of the way with water. 3. Add the fish to the broth on medium heat, if you use high heat the fish may break apart easier. Let the fish thoroughly cook in the broth for a 10-15 minutes depending how much you use. 4. Remove fish from broth and set a side for later. 5. Add the tamarind and if you are using canned pineapple drain the syrup into the pot. 6. Let the tamarind break apart and flavor the water. Then you'll want to scoop it out and discard. 7. At this point you'll want to flavor your broth with salt, sugar, and additional tamarind powder if you like it more sou. Start off with about 2 tablespoon of salt, and more sugar if needed. I went ahead and added a bit more tamarind powder. At this point the broth will seem really overwhelming with a a lot of flavor but once you add all the vegetables it will lighten it up a lot. So seasoned everything very aggressively before I add the vegetables. 8. Add the vegetables. Okra and elephant ear will take a bit more time to cook so i usually put that in first followed by tomatoes, pineapple, and bean sprouts. Try not to overcook the vegetables to much or the vegetables will lose its texture. 9. Season more fish sauce if needed. 10. Turn off the stove re-the fish to the pot if you plan to eat it right away. Add chopped ngo om and thai chili.